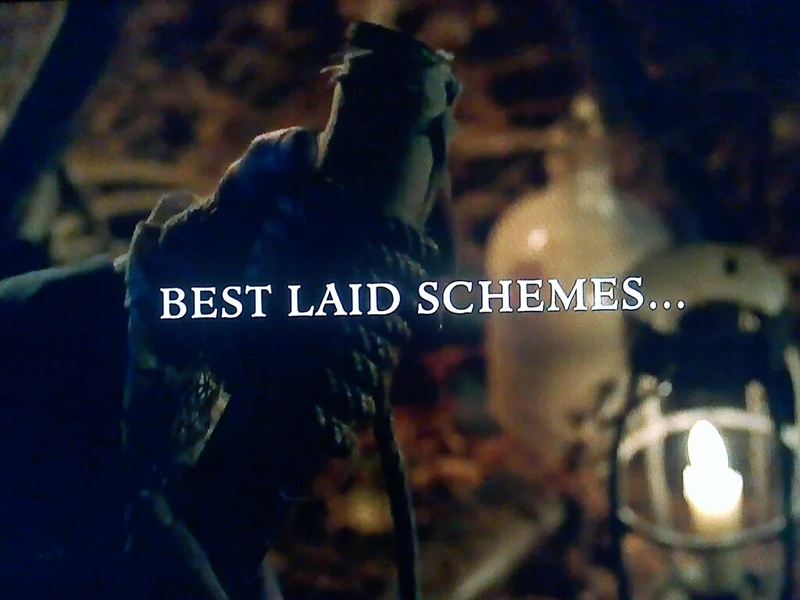 Outlander Homepage: “The best laid schemes of Mice and Men oft go awry” A recap of season 2 episode 6 by your Aussie blogging lass! 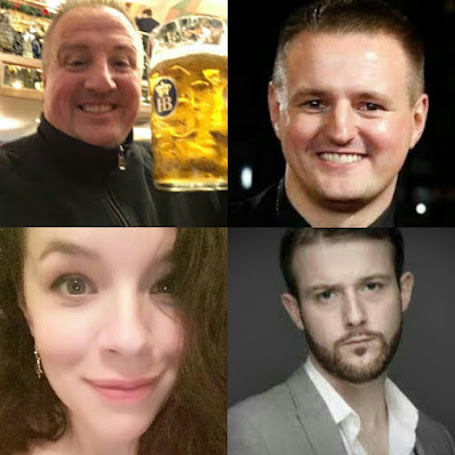 “The best laid schemes of Mice and Men oft go awry” A recap of season 2 episode 6 by your Aussie blogging lass! Ominous imagery abounds as the episode begins and the strains of the theme song merge into a dramatically charged melody. It is still the Skye Boat song, but slower, and in a slightly different key. The music is accompanied by images of people preparing for something: rope is being wound, a fire torch is lit in the darkness. The title of the episode reveals itself as “Best Laid Schemes”, and already the indication is, as Robert Burns’ quote suggests, that whatever the schemes are, they are going to go awry. In the opening scene, Jamie sits alone at his desk, deep in thought. He nods almost imperceptibly. He has made a decision. The music playing behind is the Jamie and Claire theme, so the decision must concern her. Murtagh enters and announces that Randall has been released from the Bastille. 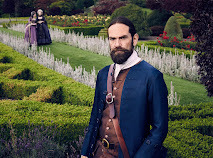 Murtagh begins to talk of dueling arrangements - contacting Randall’s second and choosing a venue and time,where they will be safe from the gendarmes. Jamie is silent, not looking his godfather in the eye. Talk then turns to Jamie’s training regime, with Murtagh offering to fetch the broadswords so that Jamie can hone his skills, but Jamie tells him that he can’t. Initially misinterpreting this as a combination of Jamie’s busy schedule and his self doubt, Murtagh is incredulous when Jamie elaborates: he won’t be dueling and has withdrawn the challenge. 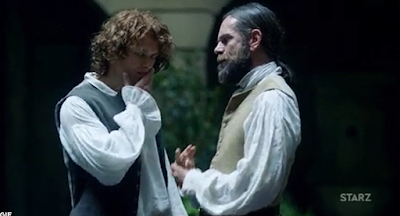 Murtagh’s frustration only increases when Jamie refuses to explain why, saying only that it’s complicated. 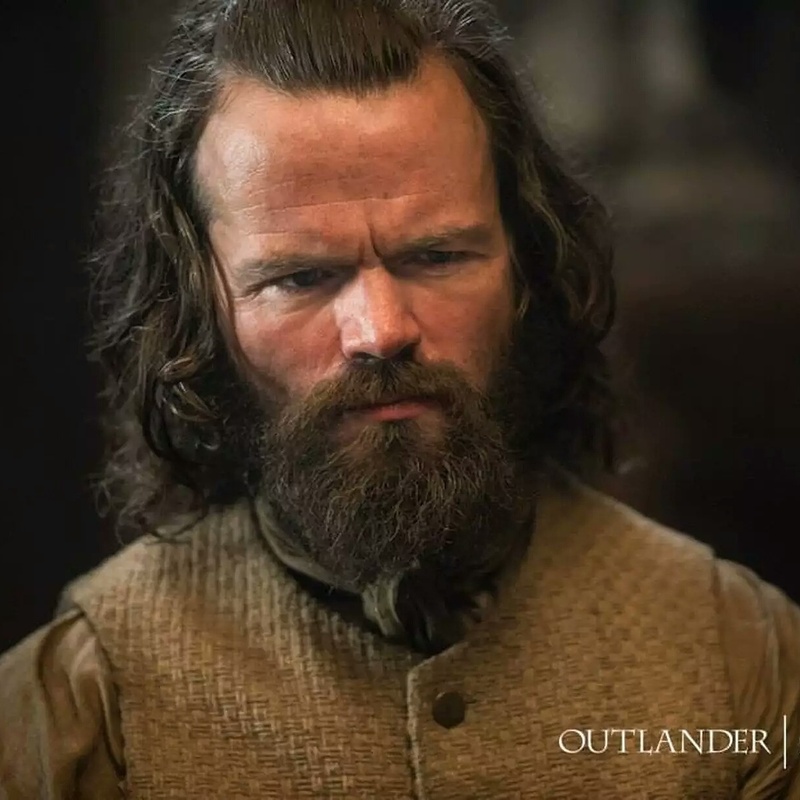 Murtagh is angry, accusing Jamie of changing his mind “like a woman in flux”. This stings, but rather than rise to the bait and explain, Jamie says only that Murtagh must trust that it’s for a sound reason. Disgusted, Murtagh stalks out of the room, almost colliding with Magnus, who is bringing Jamie’s breakfast. It is from Claire, who has left instructions that he must have a proper meal to start his day. 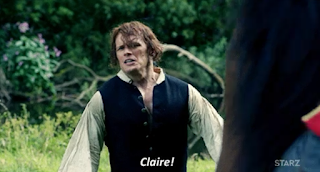 On asking where Claire is, Jamie is told she is at the hospital. Jamie’s reply, “Of course she has” has been interpreted in different ways by different reviewers. It can be argued that this is indicative of the distance between them. Without saying a word, Claire has left the house, leaving Jamie to dine alone. Others say that this is merely an acknowledgement of Claire’s determination to lead a purposeful life - even though they are in the midst of personal turmoil, she will not let Mother Hildegarde down. Over at the hospital, a heavily pregnant Claire is going about her duties when she is called over to assist Monsieur Forez. While preparing a body for burial, Monsieur Forez informs Claire that he has been called away to perform his official duties - in this case the execution of people who have been involved in the Dark Arts, as well as those who have associated with them. He gives Claire a meaningful glance, the first of many throughout the conversation. Monsieur Forez proceeds to describe, in chilling detail, the processes involved in drawing and quartering. The enthusiasm he displays in the description is reminiscent of Randall’s description of flogging in season 1 and the exchange becomes all the more sinister for this similarity. Yet unlike Black Jack, Monsieur Forez is actually delivering a warning, remarking that he has made Claire pale and that perhaps their friend Master Raymond would be better company for her. 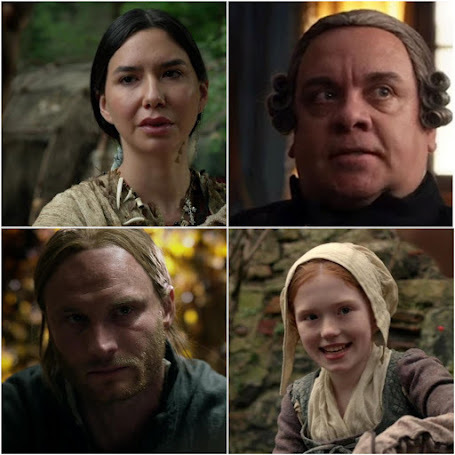 We are left in little doubt that behind his ghoulish words, Forez is giving Claire an opportunity to act to protect both her friend and herself - Master Raymond’s activities are known and continued association with him could lead Claire to meet Monsieur Forez under entirely different circumstances. 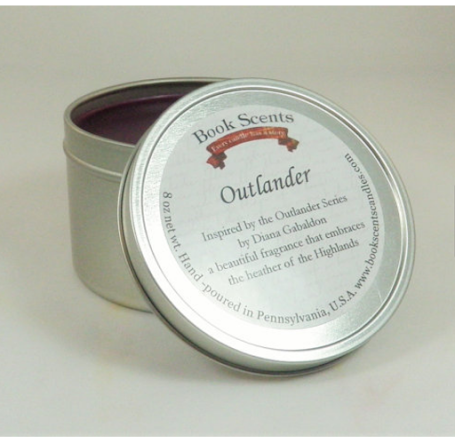 Claire takes this warning and heads straight to the apothecary. Ushered into the secret room, Claire wastes no time in telling Raymond that he must leave at once, to avoid being swept up in the King’s plan to rid the city of practitioners of the Dark Arts. Raymond is unconcerned at first, telling Claire that this has happened before and that heretics in the past have always been quickly freed. But Claire explains that this time is different. 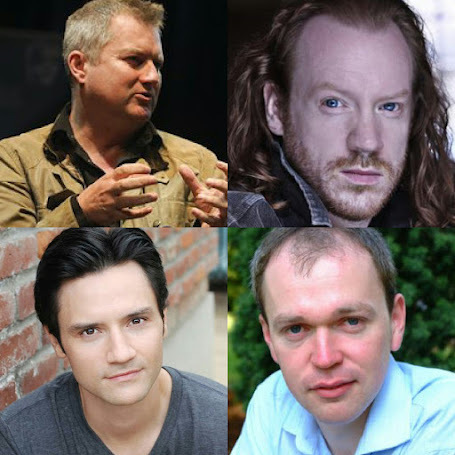 She relays Monsieur Forez’s latest mission and tells Raymond that he is in danger. Faced with this news, Master Raymond agrees to flee, remarking to Claire that she is risking her own safety by coming to warn him. She says that she is merely doing what friends do. Gratefully kissing her hand, Raymond promises that they will meet again, whether in this life or another. Back at the house that evening, Jamie is giving Claire a foot massage. Some reviewers have expressed surprise at the easy conversation and closeness between the two, given the emotional turmoil at the end of the previous episode. 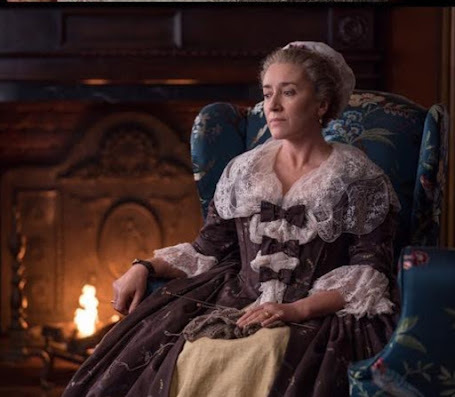 The ultimatum that Claire had given to Jamie had seemed at the time to cause an irrevocable rift between them, yet now Jamie is rubbing her feet?! As the scene continues, we discover the reason. Jamie explains that his change of heart was not because he agreed that he owed Claire a life. In fact, Jamie points out that he has saved her life on at least as many occasions and that they are even. In a speech straight from Diana Gabaldon’s book, Jamie explains his own rationale for letting Black Jack Randall live. Viewers are used to seeing poignant scenes between Jamie and Claire being beautifully executed by Sam Heughan and Caitriona Balfe and this one is no exception. Jamie tells Claire that while they are doing everything to prevent Charles Stuart’s rebellion from succeeding, the day may still come when they must face the horrors of Culloden Moor. If something should happen to him, he says, he wants her to be able to go to safety to a man who loves her. In urgent and emotional tones, and with unshed tears making his eyes bright, Jamie makes Claire promise that if she has no other choice, she will go back through the stones and back to Frank. When she agrees, he kisses her and lays his head on her belly. 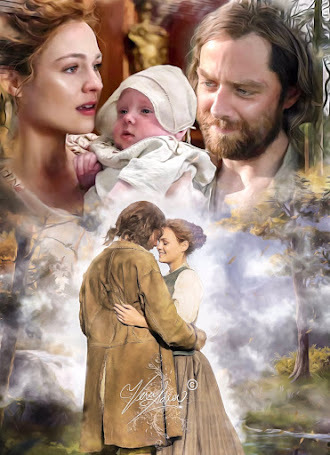 It is a perfect mixture of fear and love - neither want to think of the possibility of being parted, but promises are made all the same - not just for Claire’s safety, but for the life of their child. The agreement is all the more poignant for the fact that viewers are watching this scene with the knowledge of episode 1. Armed with that knowledge, the viewer can feel just as despairing as Claire, the look on her face clearly showing that she does not want to think about that course of action for a second. 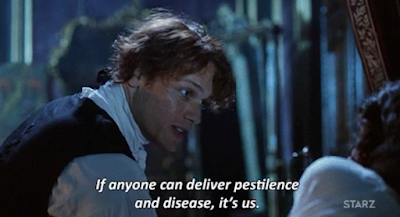 A change of pace is definitely called for and it is provided in the following scene, where Claire, Jamie, Murtagh and Fergus experiment with various herbs and potions in order to create the appearance of smallpox. Murtagh, no doubt still angry from the cancelled duel, wishes to know why this is necessary. Jamie and Claire explain that if they can thwart Charles’ wine business by having the warehouse and wine destroyed, then donations to the Jacobite cause will dry up and the Bonnie Prince will be forced back to Rome with his tail between his legs. 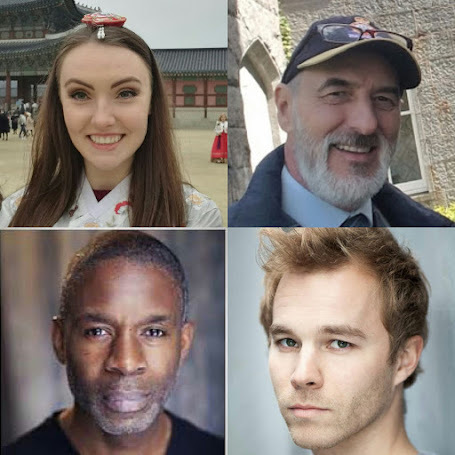 Murtagh again suggests that it would be easier to slit the Stuart’s throat, but Claire comments that this would only make him a matyr throughout Scotland. Meantime Jamie begins to swallow the potions to create the effects of the pox, seemingly undeterred by Claire’s descriptions of the vomiting, cramps and rashes that will soon occur. Fergus is more interested in playing with bandages and getting underfoot, for which he is admonished by Claire. It is an endearing maternal moment, amidst discussion of how to get the potion inside St Germain’s wine, in order to be drunk by his men. The potions begin to take hold and Jamie starts to look and feel ill. Claire is pleased at her handiwork, while Murtagh is furious. 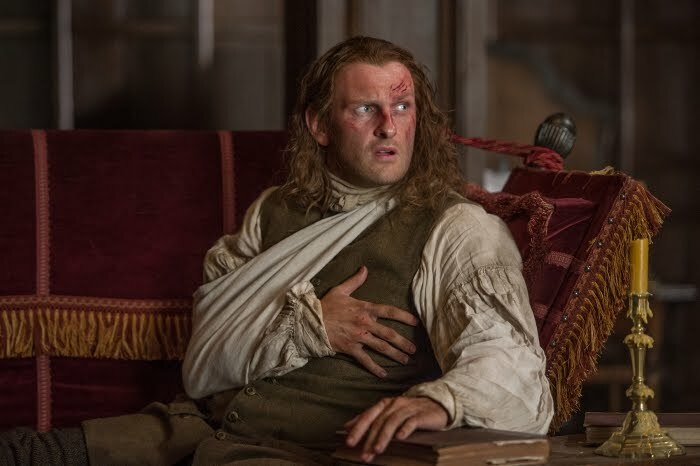 As Claire starts to try and counter the rash with a soothing ointment and Jamie lives up to the title of King of Men by not actually vomiting, they realise the time has come: they must tell Murtagh everything. Shortly afterwards, an anxious Claire watches from the window as a queasy Jamie paces the courtyard with his godfather. 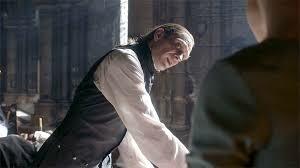 When Jamie reaches the end of the tale, Murtagh states that he has no place to contradict what he says. Striding towards Jamie, he punches him in the jaw in admonishment. 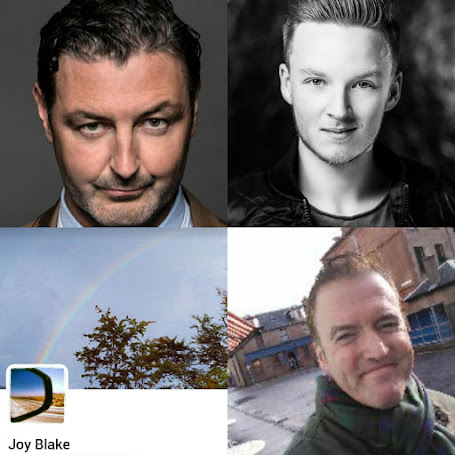 It is news, he says, that Jamie should have trusted him with from the outset. Ruefully, Jamie nods and the two move off together, a relieved Claire still watching from above. Claire farewells Jamie and Fergus, who are off on their mission to spike St Germain’s wine shipment with the herbal smallpox formula. After telling them both to be careful, Claire returns inside, to find Murtagh writing dates from 1918 to 1945 on a piece of paper. 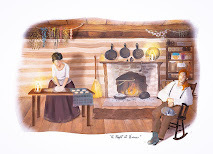 He asks her directly if she has really lived through the years in question and she confirms that she has, pointing out the year that she was born and the year that she became a nurse - or a healer, to use the 18th century term. The exchange that follows is a truly touching one. Murtagh quizzes her further, asking that if she knows the results of Culloden, she must also know when people die. 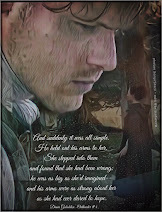 Claire replies that she doesn’t know his fate, or Jamie’s or even her own. Murtagh remarks that even if she only knows what Jamie has told him she knows, it is a burden he wouldn’t want to have to carry. He places his hand over hers and she gives him a tearfully grateful look in return. 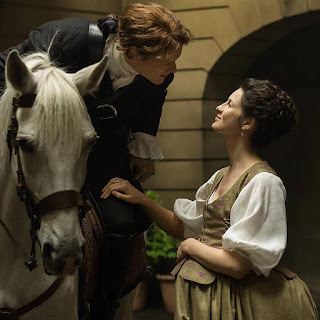 In the books, Murtagh is never explicitly told of Claire’s history, although it is certainly feasible that given his closeness to Jamie he would have known. The decision to provide TV Murtagh with the knowledge is a welcome one, as it also creates a touching bond with Claire, further cementing the relationship that began in season 1. After what we assume is a lengthy day of companionable riding, Jamie and Fergus have located the wine shipment. 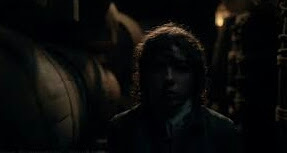 Putting his pickpocket talents to good use, Fergus slips through the darkened warehouse, soon emerging with two bottles of wine. Jamie removes the seals, tips out some of the wine and tips in the concoction, instructing Fergus to place the bottles where the men are sure to find them. He also hands Fergus the bottle of nettle mixture that will produce the rash and tells the boy to brush the liquid onto the inside of the men’s coats. Fergus does as instructed and, mission completed, the two gallop away into the darkness. Arriving home late, Jamie enters the bedroom and an anxious Claire asks if they had been successful. Jamie remarks that he hadn’t stayed around to find out. Claire says that it must work: Charles Stuart must be prevented from getting the money he needs. 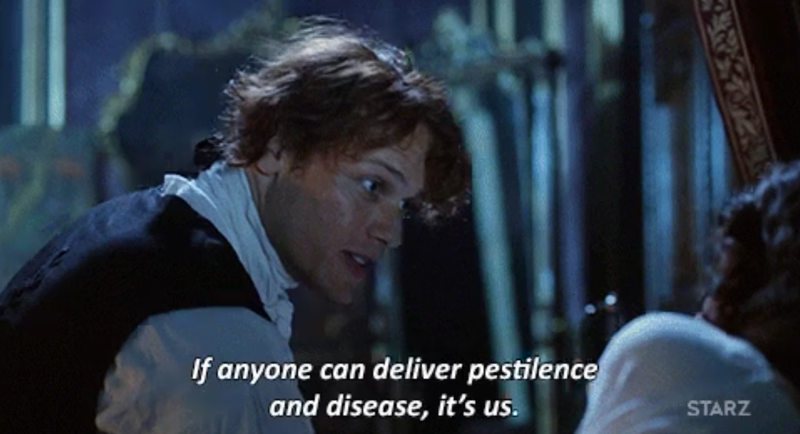 Jamie responds by telling her not to worry - if anyone can deliver pestilence and disease, it’s them! With a sigh, he falls into bed beside her - and it’s lovely to see that their affection is back. Jamie’s next visit to Maison Elise sees him beckoned into a room by none other than Charles Stuart, who is accompanied by the Comte St Germain. The Prince is nervous; the Comte disgusted. We soon discover that Jamie and Fergus have indeed been successful. There has been an incident at the Comte’s warehouse, Charles tells Jamie. 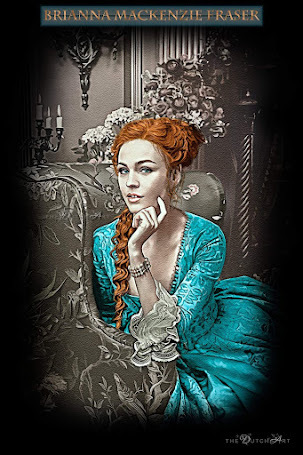 St Germain adds that some of his men have been stricken by an illness that is possibly contagious and that while the affected men have been hidden away, they will soon be missed. Charles informs Jamie that as a result they will need to move the wine immediately, to which Jamie remarks that this may prove damaging to his uncle Jared’s wine business. It is a comment that causes the Comte to explode, shouting his mistrust of Jamie and the fact that Jamie has tried to ruin him before. The Prince attempts to placate the Comte, at the same time reminding Jamie that the profits from the endeavour will be the seed to expel the Hanoverian usurpers to throne, to regain the soil and restore the blessed King. 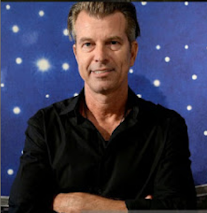 Jamie acquiesces, saying that while he has yet to secure buyers, he will arrange transport of the wine to his warehouse at once. 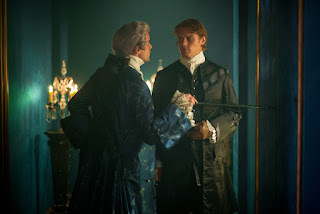 Charles proclaims Jamie to be a loyal and true patriot, a comment that draws a disgusted response from the Comte, who announces his intention to accompany Jamie in order to watch over his investment. This is an unwelcome development, but Jamie gives no hint of concern, sarcastically remarking that the Comte’s conversation will be a pleasant diversion on the lonely road to Le Havre. The next scene once again provides some comic moments, as the Frasers adjust to the new developments. 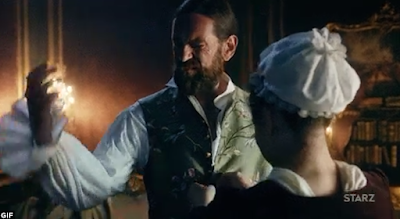 Suzette is dressing Murtagh into some fine French clothing, much to the gruff Scotsman’s disgust, complaining that playing a Jessie is bad enough, but now he has to do it in clothes which hinder his movements. Claire too is concerned. 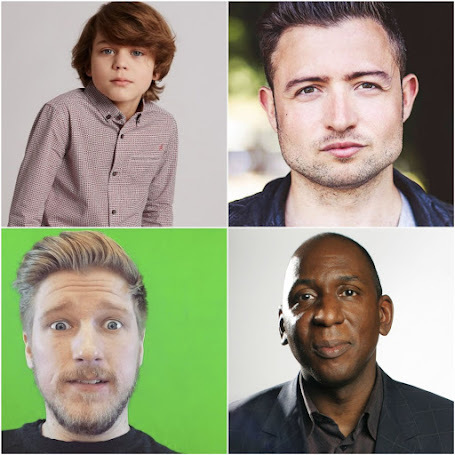 Jamie has hired some men to act as highwaymen, but can they play the part? 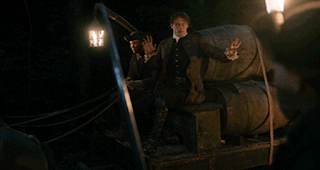 It is a dangerous endeavour and Jamie acknowledges the fact, saying that the plan revolves largely around not being caught. Claire remarks that occasionally Jamie could lie to her in order to put her mind at ease, information that Jamie promises to bear in mind for next time. Claire is not convinced, remarking that it is needlessly risky, particularly considering that the Comte St Germain will be there too. Murtagh says that they have devised a plan for the Comte and Jamie assures her that he has thought through everything and that it will do. 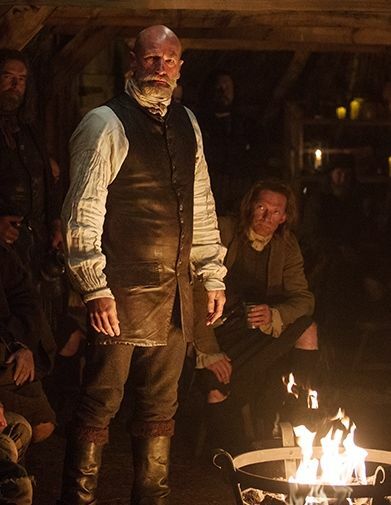 Besides, he reasons, Jamie will merely be a merchant transporting goods and that it will be Murtagh in the line of fire. Murtagh adds that if he is caught, he would like Jamie to kill him, as he has no intention of being hanged in his current outfit. Suzette steps forward at this point, promising to take him away and get him undressed at once. It is a lighthearted ending to a potentially serious turn of events. 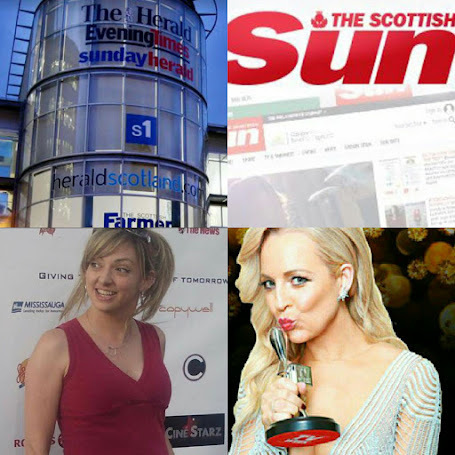 In bed that night, Claire apologises, stating that bad things tend to happen when they are apart. Jamie smiles at her, saying that they always find a way back to each other. Rubbing her belly, Jamie is startled by a sudden movement - a kick from the baby. The romantic moments of the previous scene are starkly contrasted by the one that follows. An increasingly preoccupied Claire is enduring the simpering and giggling of Louise and her ladies, who are making off-colour observations about mutual acquaintances. At the same time, Jamie and the Comte are making their way through the darkness with the shipment of wine. The viewer soon realises the reason for Claire’s irritation with Louise and the others - she is worried about Jamie. At the arranged time and place, Murtagh and the other “highwaymen” surround the wagons, ordering Jamie and the Comte to drop their weapons and give up the cargo. The Comte is adamant that they keep going, aiming his pistol at a masked Murtagh, refusing to get down off the carriage and promising that Murtagh and the others will be hunted down and hanged. Obviously carrying out their prepared plan, Jamie knocks the Comte out of the way, just as Murtagh fires a shot wide of the two men. The other men capture the Comte while Jamie appears to leap onto Murtagh and fight him, indicating with a nod of the head when it is time for Murtagh to “overpower” him. 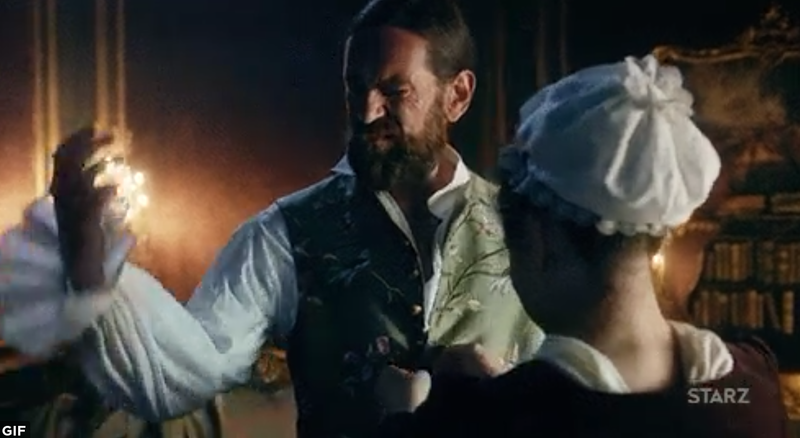 Murtagh obliges by knocking Jamie unconscious. We are then returned to the simpering ladies, with whom Claire quickly loses all patience. She asks if they are distressed by the way that the city treats the poorest of its citizens. The ladies completely miss the point, with Louise saying that the gendarmes should remove the poor to the less desirable parts of the city. 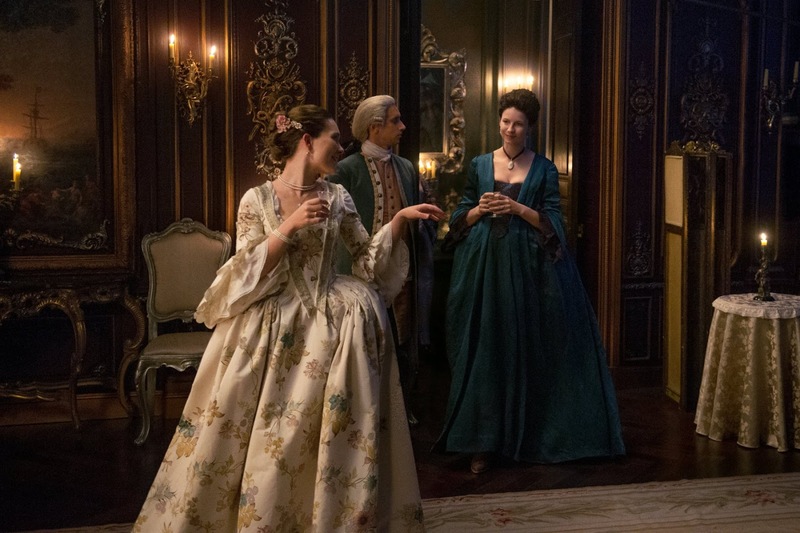 Unable to bear the women a moment longer, Claire leaves the room and the others resume their gossip session. With Fergus as chaperone, Claire goes to the hospital. She tends to the patients,while Fergus plays with Bouton. But something is wrong. Mother Hildegarde notices Claire’s exhaustion and insists that Claire goes and rests. Claire tries to tend to more patients, but the older woman tells her that unless she wishes to become one herself, she must stop and lie down. Claire agrees. While helping her onto the bed, Mother Hildegarde notices spots of blood on Claire’s stockings. She is bleeding. Mother Hildegarde reassures Claire that it is nothing to be overly concerned about, as bleeding can happen at this stage. Nevertheless she insists that Claire should stay the night at the hospital, agreeing to send Fergus home with a message for Jamie. Jamie, meanwhile, is nursing a sore head, courtesy of Murtagh’s knockout punch. A distressed Charles Stuart is fearing ruination, saying that he will be persona non gratis with the bankers. The Comte meanwhile is suspicious at the timing of the attack. His intimation is clear - and Jamie tells him that false accusations can have dire consequences. The two leap simultaneously to their feet, ready to fight. The Prince stops them, reminding the Comte that by his own account Jamie had saved him from attack and that the discord will not recover his wine. As Charles launches into a speech of self pity, we see Jamie struggling to contain his pleasure - it looks like the mission has succeeded and that Charles will indeed be unable to mount a Jacobite rebellion. But still playing the part, he reaches out a hand to comfort the prince, who immediately starts to cry, promising to take his own life if he is forced to live in “Godforsaken Poland”. 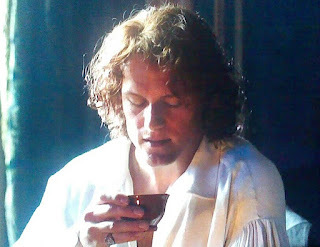 It is morning by the time Jamie arrives home and Fergus greets him with the news that Claire is at the hospital. 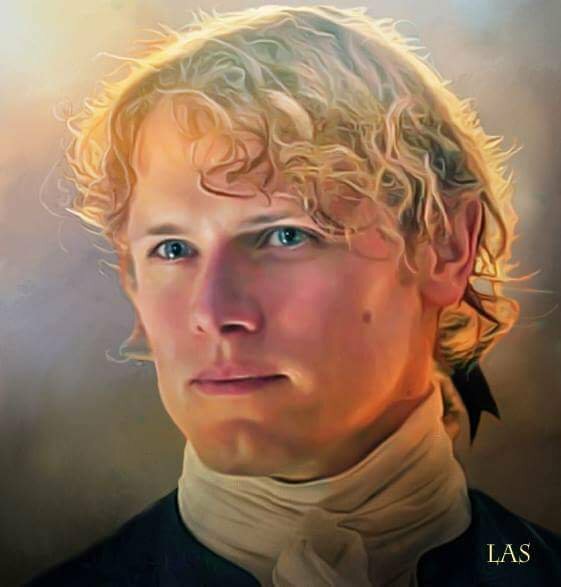 Jamie is concerned, but Fergus, who undoubtedly does not know that Claire has been bleeding, tells Jamie that Mother Hildegarde had suggested that Claire stay there to save her walking the streets at night and that he, Fergus, had allowed it. With a grin, Jamie says that he was wise to leave his wife in such capable hands and the two share a companionable breakfast. Fergus asks when Murtagh will return and Jamie answers that he may be gone for a month or two, as he has gone to Portugal to sell the wine. 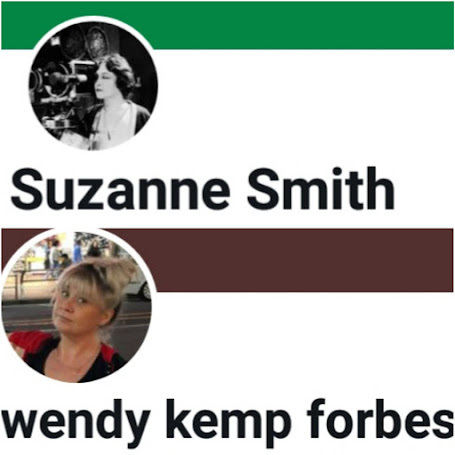 Suzette interrupts their discussion to inform Jamie that Charles has gotten himself into trouble at Maison Elise, running up a substantial bill. Madam Elise has threatened to call the gendarmes if he does not pay. Fergus offers to go as Jamie’s proxy, but Jamie refuses saying he should go himself, not wanting the gendarme to make enquiries as to his business affairs. Fergus states that he will accompany him, to guard his right and Jamie remarks that he will be honoured. On arrival at Maison Elise, Jamie tells Fergus to wait while he settles the bill. But, in scenes reminiscent on Claire’s refusal to “stay put” in season 1, Fergus too goes wandering, spying a bottle of perfume on a table inside an unlocked bedroom. 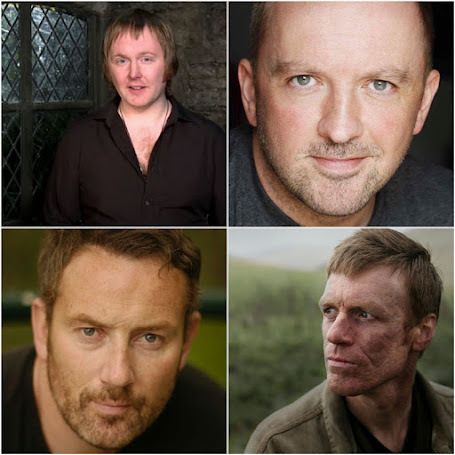 As Fergus moves to the bottle, the camera pans around the room and we see a red military jacket hanging up. Suddenly the door closes and the ominous music builds. 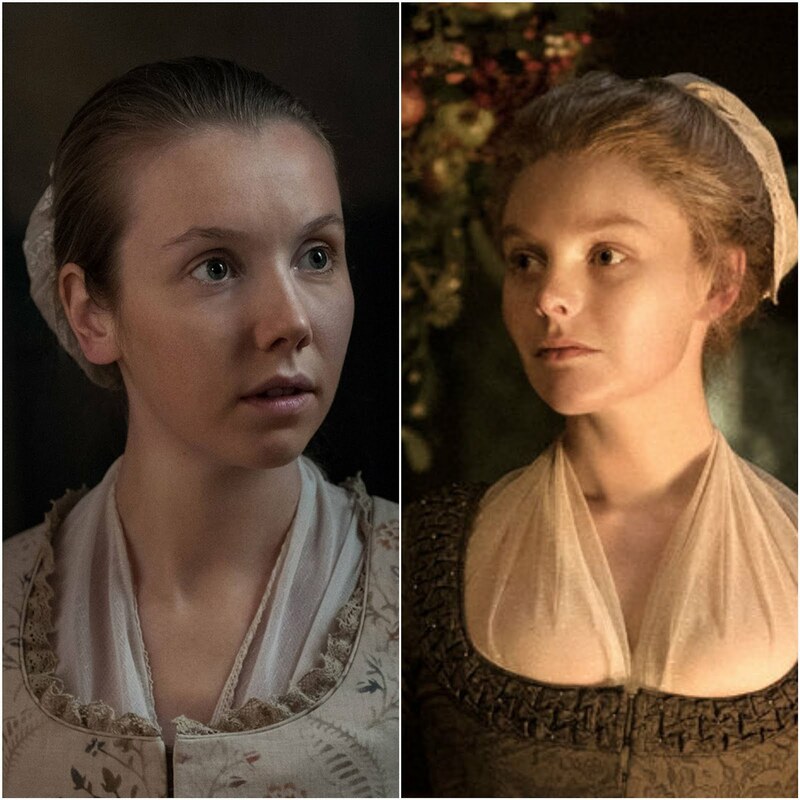 A sickening parallel is drawn with season 1 - when Claire disobeyed Jamie’s orders to stay put, she ended up at the mercy of Black Jack Randall. Although we have only seen Fergus’ look of alarm, tv viewers can’t help but worry that the young boy is about to find himself in a similarly perilous situation. After her night at the hospital, Claire is greeted by the servants back at home, but none will meet her eye. She asks Suzette where Jamie is, but the maid refuses to answer at first. Spying Jamie’s brace on the bed and realising that he must have returned from Le Havre, Claire asks again. Reluctantly, Suzette tells her that Jamie has gone to the wood, after getting into a fight with an English officer. Shocked, Claire asks the name of the officer and what had happened. 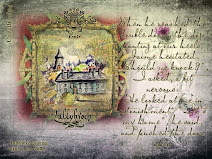 As Suzette haltingly begins to explain the story that she has been told, Claire spies a note on the dresser. “I am sorry. I must. J” it reads and Claire’s worst fears are realised. Jamie has broken his promise and has gone to fight Black Jack at the woods. 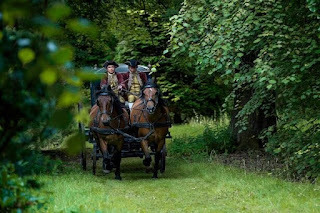 Accompanied by Magnus, who refuses to allow her to go alone, Claire gets back into the carriage and heads for the woods. She is distraught, admonishing Jamie aloud for breaking his promise to her, while her fingers touch Frank’s gold wedding band. She is also obviously unwell, breathless and repeatedly grimacing in pain as the carriage thunders towards the woods. Magnus helps her towards the spot, Claire moving clumsily and hanging onto the butler for support. 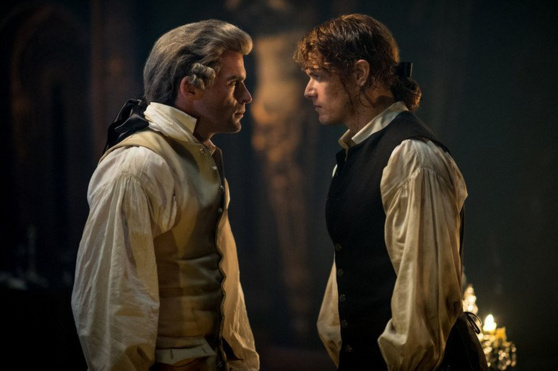 The duel is underway and Claire’s plan to call out to Jamie is abandoned. Instead, she says, she can do nothing but wait to see which of her men will die. By now, Magnus is just as concerned for Claire as he is for Jamie. She is groaning in pain, hanging onto the tree for support. The fight is vicious, the two men evenly matched. 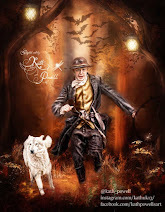 Black Jack goads Jamie further, asking how Claire forgave him and more frenzied sword play sees the two men both lose their balance before advancing on each other once again. Suddenly, there is nothing but blood. Claire doubles over, blood coursing down her legs, to the horror of Magnus standing beside her. Jamie lunges for Black Jack, his sword piercing Randall’s groin. Randall falls, his hands covered with blood and his eyes glazed with pain. With a cry to Jamie, Claire does the same. 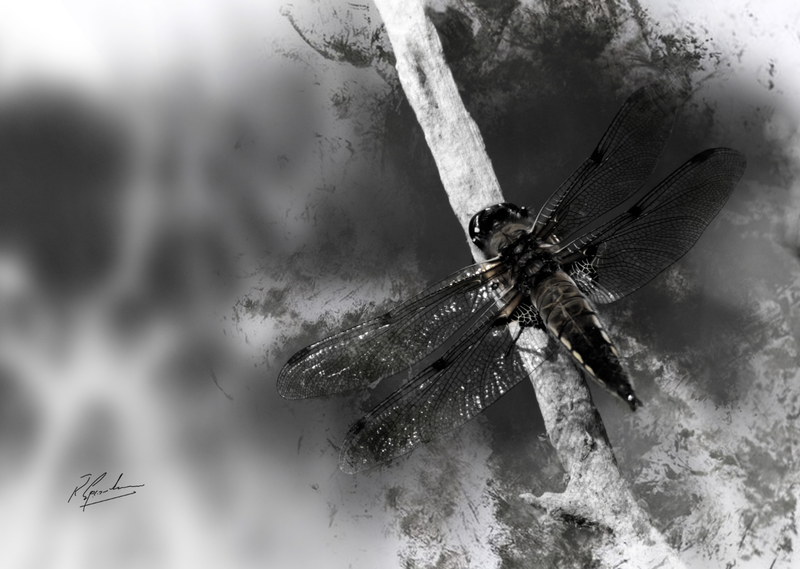 Jamie hears her and looks over in horror, as the gendarmes thunder into the clearing. Desperate to get to his wife, Jamie drops his sword, but is surrounded by the officers. His cries become all the more anguished, screaming out “Claire!” as she rapidly begins to lose consciousness. She manages to tell Magnus to take her to Mother Hildegarde and with one last “Jamie”, she passes out. While book readers knew that this was coming, seeing it played out is every bit as emotional as reading Diana Gabaldon’s original words. 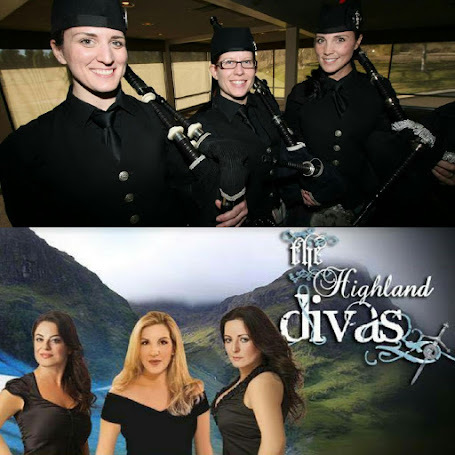 The title of this episode is taken from the Scottish poet Robbie Burns’ poem, “To a Mouse.” The seventh stanza of the poem reads, in part: “The best laid schemes o' Mice an' Men, Gang aft agley, An' lea'e us nought but grief an' pain, For promis'd joy!” This translates as: “The best laid schemes of Mice and Men oft go awry, And leave us nothing but grief and pain, For promised joy!” The final scenes of this episode personify Burns’ words completely. Jamie had promised to allow Randall to live for one year, in order to ensure that Frank’s ancestor would be conceived. 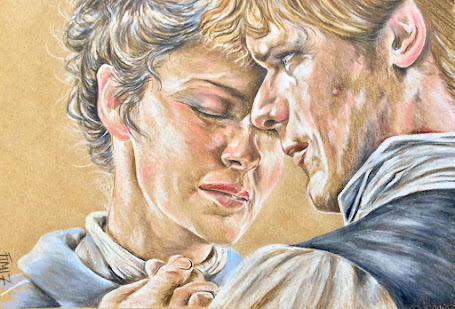 It was a decision made specifically to secure safety for Claire and their child, regardless of what happened with the Jacobites. But for reasons yet to be explained, Jamie has broken his promise and it is an action that has resulted in nothing but grief and pain, as emphasised by his impassioned cries. With one sword blow, he has undoubtedly rendered Randall incapable of fathering a child, thereby potentially ending Frank’s life before it begins. 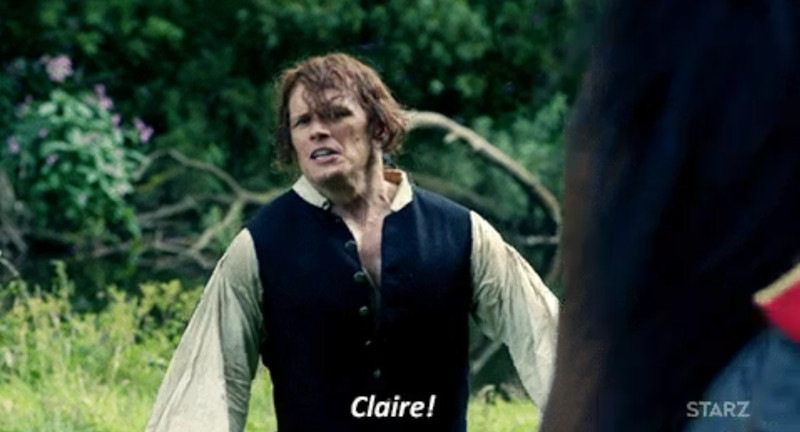 The shock of seeing the duel has caused Claire’s collapse and, it appears, the miscarriage of their child. As Jamie is led away by the gendarmes, he knows no-one’s fate - Randall and Claire may both be dying and he may see himself hanged. The promised joy of meeting his child has gone and all that is left is grief and pain. And you can’t get more awry than that. This episode recap was written by Susie Brown, a teacher-librarian and children’s writer who lives in Australia. She is already stocking up on tissues for the next episode. 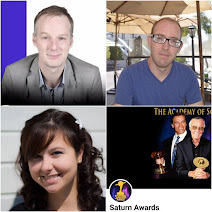 Terry Dresbach's Newsletter, Saks Finally! 10 reasons to read Outlander! 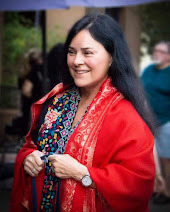 Outlander, Ron D Moore's Podcasts, Season Two. Review of Season 2 Episode 205, The Nerdist.